Commerce by Artists: Lin Yilin (pages 262-263). In a recent interview, the Scandinavian artist duo Elmgreen & Dragset comment on the potency of art's intrinsic value: "Its lack of direct effect is what makes it urgent in this world that is so focused on efficiency and results." 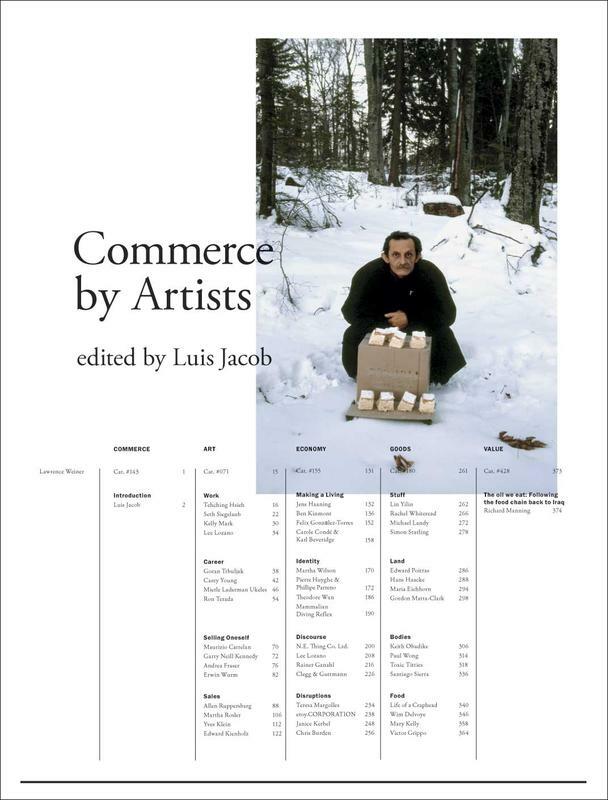 In Commerce by Artists, editor Luis Jacob, who is also an artist, makes a parallel statement by bringing together a collection of projects that are powerful in their powerlessness, at least in a conventional sense. The book revives an unnamed series published by Toronto's Art Metropole, which began in 1976 with the publication of Video by Artists edited by Peggy Gale. Titles appeared with some regularity until the release of Sound by Artists edited by Dan Alder and Micah Lexier in 1990. Like its predecessors, Commerce by Artists reads like a portable exhibition, carefully curated and considered by Jacob. Jacob takes an expanded meaning of "commerce" here as flow and flux: "Commerce occurs if there is a flow or transfer of something from one place to another...if the identity of something has flowed or transformed to become another identity..." The book's four sections — Art, Economy, Goods and Value — are a collection of art projects that illustrate Jacob's holistic definition of the term in question. The "Art" section includes projects that speak directly to art as commodity and to artists as workers. For example, the section includes six pages of documentation relating to Tehching Hsieh's Punching the Time Clock (1980-81), a performance that required the artist to punch a timecard in his studio every hour on the hour for an entire year. This piece conflates the unpaid labour of artists and waged factory work, and makes a strong contribution to Jacob's reframing of commerce as change, particularly when considered as part of the Hsieh's oeuvre. Consider Cage Piece (1978-79), the first in his series of one-year performances. For this piece, Hsieh's spent 365 days living alone inside of a cage that he built in his studio. The artist denied himself reading material, music, company, conversation and stimulation of any kind for the duration of his performance. He didn't write, save for marking the passing days on his wall, and his studio assistant bought him food and took away his waste. Hsieh's works are experiments in being, forced existential experiences that secede from conventional life and celebrate the deliverance of pure survival. His practice is transformative in a palpable sense, thus exemplifying Jacob's particular definition of commerce. In "Economy", we find works that take interest in or utilize the market. Featured in this section is Haircuts by Children by Mammalian Diving Reflex, which inverts normal commercial conditions to create community change. The first incarnation of the project was realized in 2006, when a Grade 5/6 class from Toronto's Parkdale Public School was trained to give haircuts and put in charge of a salon. No money was exchanged, which placed more emphasis on the human variables of trust, authority and vanity. The event thrust people together who wouldn't normally socialize and invited adults to surrender to children, reinforcing Jacob's interest in the possibility of commerce. "Goods" takes consumption and commodity as its subject. Its collection of art works includes Break Down (2001) by Michael Landy, for which the artist destroyed all his possessions in a two-week period. Break Down took the form of a reverse assembly line in an empty commercial space on London's Oxford Street. Approximately 5,000 itemized objects were mobilized on a conveyor belt, and then dismantled and destroyed by the artist, who walked away with literally nothing. The movement of objects from Landy's home to the landfill, and the self-imposed shift away from consumerism to austerity, promote the alternative, radical idea of commerce. Commerce by Artists ends with "Value", an art-free section featuring an essay by environmental journalist Richard Manning on 'the oil we eat'. The piece deconstructs the idiocy that riddles our primary economy: energy. After reading that over 80 percent of American cropland is covered by inedible grain corn, which is processed into calorie empty breakfast cereal or fed to cows that are physically incapable of digesting it, one finds relief when Manning describes picking up a rifle and shooting an elk for his family: "I used a rifle to opt out of an insane system...I killed, then the rest of those elk went on, as did the grasses, the birds, the trees, the coyotes, mountain lions...all of it went on." This violent moment sheds new light on Jacob's project, which is defined by those daring to take their own shots in the wilderness. By enslaving themselves, handing shears to children or purging their earthly possessions, artists are working to escape the seemingly inescapable. Their quiet, though sometimes self-destructive, acts of protest are ultimately futile and small, making them all the more potent. We're left believing that art can and must save the world. Vanessa Nicholas is a freelance writer based in Toronto, where she also works as Programs Coordinator for the OCAD U Student Gallery. She completed her MA History of Art at the Courtauld Institue of Art in 2009 and has since worked at the Venice Biennale, the Power Plant Contemporary Art Gallery and Canadian Art magazine. She blogs at blogthegood.tumblr.com.